The Great 80s January 19, 2011 January 19, 2011 No Comments on Missing Persons not missing anymore? After 24 years, Warren Cuccurollo is reuniting with Missing Persons, featuring lead singer Dale Bozzio. Many people hail Dale Bozzio as the original Lady Gaga. Warren was initially with Frank Zappa, before moving on to Missing Persons and then Duran Duran. Missing Persons disbanded in 1987 after a string of hits and a huge “cult” following. Missing Persons has now reformed for a world tour and a new album. In 1980, Cuccurullo and the two Bozzios, Terry and Dale, formed Missing Persons, added Patrick O’Hearn and Chuck Wild, recorded a 4-song EP called ‘Missing Persons’, toured, promoted the EP, and appeared in the movie Lunch Wagon. Two years of hard work led to a signing with Capitol Records in 1982, the release of the album Spring Session M, and the subsequent success of Missing Persons on radio and MTV. The singles “Mental Hopscotch”, “Destination Unknown,” “Walking in L.A.,” “Words,” and “Windows” all met with success. The band appeared at the three-day Southern California concert, the US Festival in May 1983. In 1984, Cuccurullo invented a new type of guitar he called the “Missing Link”, and used it on the experimental album Rhyme and Reason (1984). The band followed up with the more conventional Color In Your Life in June 1986, but during the short-lived promotional tour, increasing tensions between then-husband and wife, Terry and Dale Bozzio, led to the end of the tour and the band. Dale Bozzio was the main creative focus of Missing Persons, one of the 80’s most provocative new music aggregates; singer/ songwriter/ conceptualist Dale had a habit of turning up at just the right time, in just the right place. Like at the top of alternative international music charts, on critics “Best Of Lists” and on concert stages where her distinctive voice and dazzling good looks earned her a fervent following worldwide. In 2010, Dale has signed a worldwide distribution agreement for her new album ” Make Love Not War ” with leading Australian Indie Label ” Blue Pie Records “. As the CEO, Damien Reilly says ” We are honored to have Dale on the label. She is undoubtedly one of the 80’s biggest influencers of fashion and her unique vocal style can be heard today in other artists like Lady Gaga and Gwen Stefani. A fashion icon of all things 80’s in her day, the world has now come full circle to now totally appreciate her originality”. This relationship with Blue Pie is flourishing and delivering results with a placement of Dale’s song ” Simple Simon ” in a new Australian independent film called ” Dealing with Destiny “. With a load of new interest in her music and all things “Missing Persons” it seems that everyone now wants to know the original ” Lady Gaga “. Do a Google and check out some of the shots of Dale in her prime and you’ll soon see that she could be mistaken for Lady Gaga. Dale has worked with many of the worlds super stars and is at home on the stage doing what she does best and that is entertaining her fans and making the world enjoy themselves for the moments that she shines with her magical pop powerhouse hits. No matter how hard you look, your never gonna find anyone as exciting, talented and totally original as Dale and Missing Persons. Missing Persons will reform for a series of concerts to be announced in the coming months. Get ready world to dust off those spandex tights, get your hair as big as you can and to start singing the many hit songs of “Missing Persons” that made Dale Bozzio and Missing Persons household names back in the day. ” What Are Words For ” was one of the bigger hits in Australia and stayed on the charts for an impressive 6 months. We are all looking forward to more and more words from Dale and Missing Persons. For all the latest news on Dale Bozzio you can visit the following websites. Teena Marie, a celebrated R&B singer-songwriter, was found dead Sunday at her California home, her manager said. The trailer for Take Me Home Tonight has debuted on YouTube. The film takes place in the late eighties and is about a recent college grad who chases after his dream girl at a labor day weekend party. It is scheduled for a March 2011 release. There is plenty of great 80s music in the movie, so it is a must see for the 80s fans out there. It’s also fun to remember all of the 80s pop culture.. check out those Pepsi bottles in the opening scene of the trailer! Since 1986, only two bands have claimed the honor as the top-grossing act twice in three years: the Rolling Stones (1998 and 1999) and the Grateful Dead (1991 and 1993). But this year, another act can claim that title: Bon Jovi. For the second time in three years, Bon Jovi ranks as the highest-grossing touring act. The band’s achievement, this year and previously in 2008, demonstrates that, remarkably, the group is hitting its touring peak 26 years after releasing its debut album. Marc Malkin is reporting that Tom Cruise is in talks to join the movie adaptation of Rock of Ages. Not only will he act, but he will also do his own singing! Rock of Ages is a Broadway musical about the famous LA Sunset Strip in 1987. 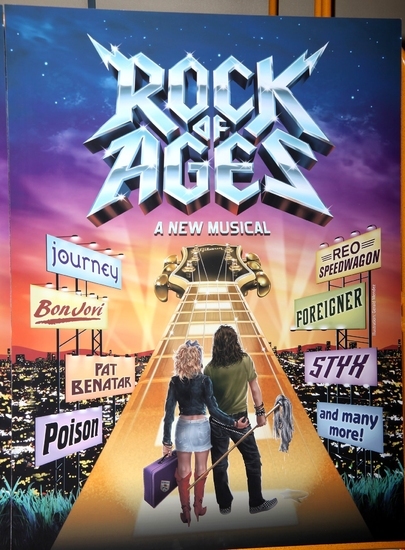 The musical’s website describes it as ‘an arena-rock love story told through the mind-blowing, face-melting hits of Journey, Night Ranger, Styx, Reo Speedwagon, Pat Benatar, Twisted Sister, Poison, Asia, Whitesnake and many more‘. If nothing else, this should provide an awesome soundtrack. Before today, the TDK brand meant only one thing to me: mixtapes. Just the mention of it makes me nostalgic for peeling the cellophane off a 5-pack of cassettes, like a fresh pack of cigarettes. It’s been at least 15 years since I dubbed a tape, and honestly, TDK has been off my radar ever since. That is, until today, when they dropped by CNET to show off the coolest-looking portable speaker I have ever seen in my life. When I saw TDK’s latest Three-Speaker Boombox (seriously, that’s their name for it), I think I may have squealed a little. Priced at $499, set for unveiling at CES, and due out in January, this sonic beauty hits on all cylinders–combining sound, features, and design in a way makes my audio nerd heart swoon. To record his latest album, “No Better Than This” (Rounder), John Mellencamp hatched a plan with producer T Bone Burnett. They would set up a mono tape recorder and a single microphone and knock out a bunch of new songs with a small band. It was old-fashioned recording in the extreme, with an added twist: The “recording studios” were the First African Baptist Church in Savannah, Ga., a sanctuary for runaway slaves before emancipation; Sun Studios in Memphis, one of the birthplaces of rock ‘n’ roll; and the Gunter Hotel in San Antonio, where blues legend Robert Johnson recorded. It all might sound like a gimmick, but the music’s rambunctious charm and playful spirit argue otherwise. It adds up to one of Mellencamp’s best albums, in a career that has seen the former John Cougar move from a Springsteen-lite phase (“I Need a Lover”), find his niche as a small-town storyteller (“Jack & Diane”), become the unofficial voice of Farm Aid (“Rain on the Scarecrow”) and reinvent himself as a folk-oriented singer-songwriter. In 2006, he dropped his long-standing opposition to licensing his songs for use in TV commercials; his song “Our Country” appeared in a car ad and then anchored his final album for a major label, “Freedom’s Road.” But now he’s an independent artist, and he says his days of listening to record company executives’ advice about how best to sell and market his music are over. In a recent interview, Mellencamp discussed his life as a “recovering” rock star. With their feel-good party anthems, the Black Eyed Peas have never had a problem bridging the generation gap. And on their upcoming album, The Beginning, the group infuses their modern sound with classic ’80s songs. In the latest issue of SPIN, frontman will.i.am says that the album, due out on November 30, was recorded in hotel rooms around the world during BEP’s last world tour. The bandmates revealed that they’re big fans of ’80s music and pop culture and wanted to connect past and present on this LP.